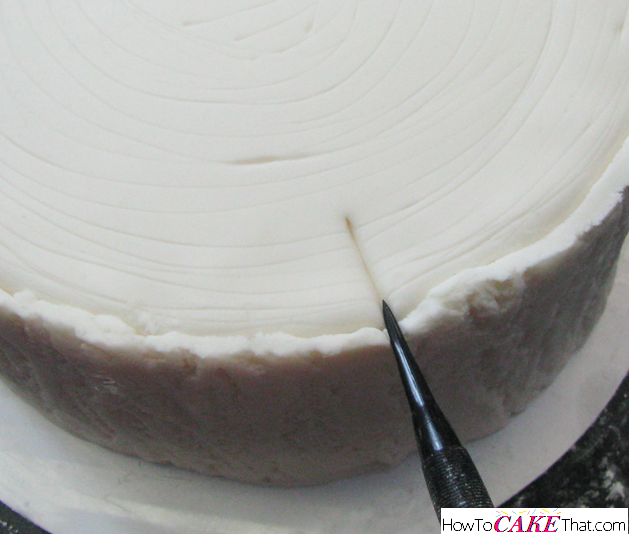 First, I filled and frosted my 8 inch round, 4 inch high cake and refrigerated it until the frosting became firm. 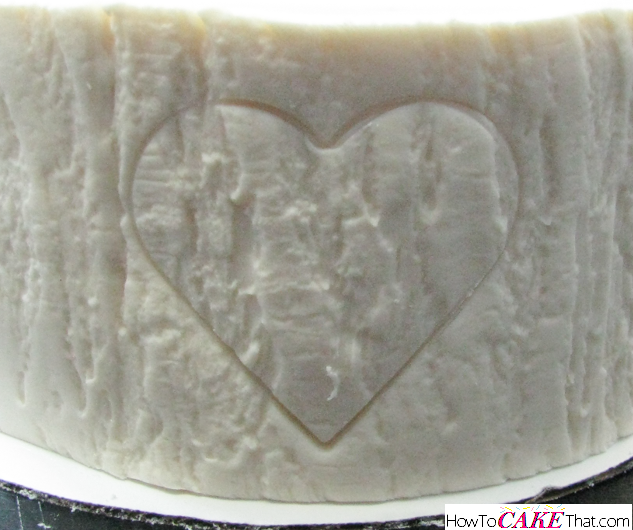 Next, I colored my fondant a light Ivory color using Americolor gel in Ivory. I removed the chilled cake from the refrigerator, rolled out my fondant and covered the cake and trimmed away the excess fondant. I then placed my cake onto my cake turntable. 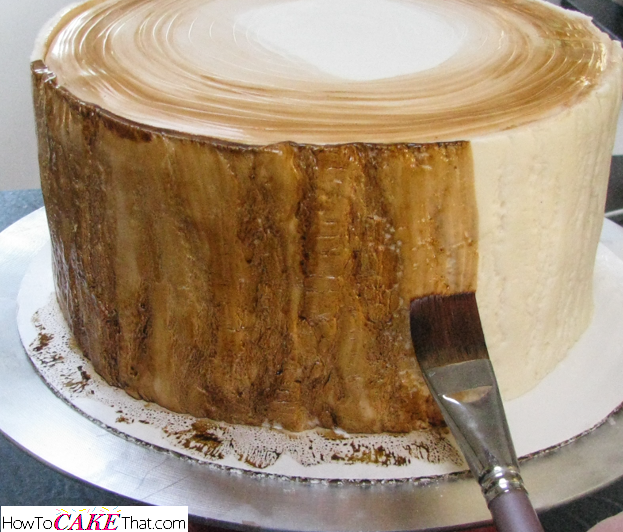 I began lightly spinning my cake on the turntable and, using a small pointed veining tool, I began marking the tree stump's rings on the surface of the fondant. Now here comes the coolest part! Check out the texture on this impression mat!! Only Sugar Delites would carry something so real and so awesome!! This one is called "Bark Texture Mat" by DTC, and it was cast from a real pear tree! 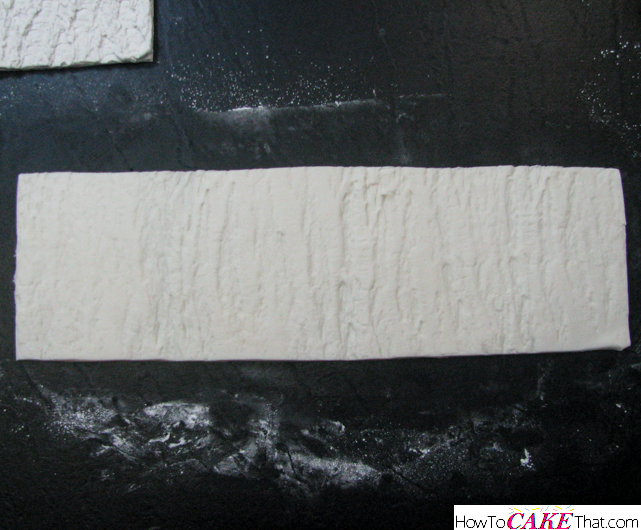 To create the bark for the cake, I rolled out a wide strip of ivory colored fondant. I ensured my strip of fondant was taller than my cake and was also thick enough to allow for the impression mat to be pressed into the fondant without making the fondant too thin. Then I placed the impression mat on the fondant face down, and used a fondant roller to roll up the impression mat - use firm pressure when rolling over the impression mat, and one pass should be enough to leave a nice deep texture. Doesn't it look so cool!! Next, I cut out a panel of fondant bark to wrap around my cake. To begin making the panel, I used a ruler to make a nice straight edge for the bottom of the panel. I used an Xacto knife to trim the edge. Next, I trimmed straight edges on the ends of the strip. 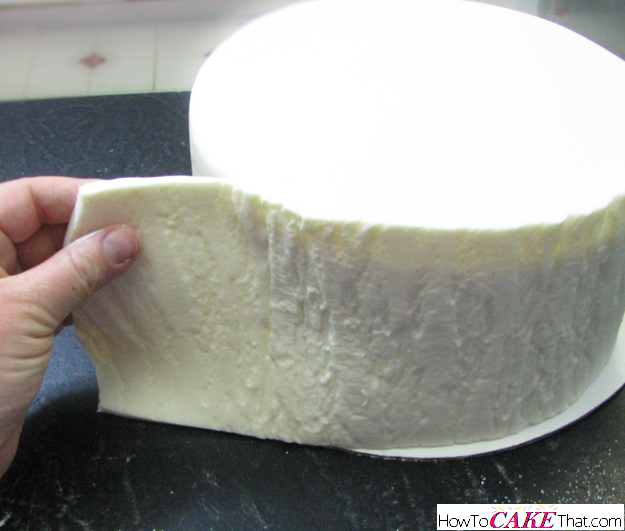 And I also measured and cut the top so that it would sit about 1/4 to 1/2 inch taller than my cake. It's always better to have too tall of a panel than not tall enough. 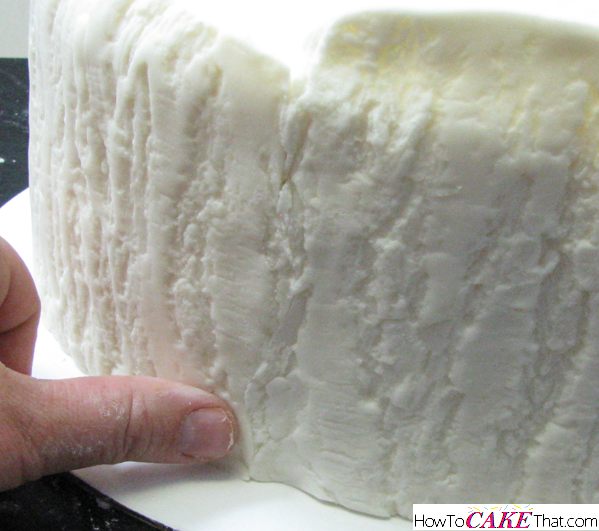 We will trim away the excess fondant later on. 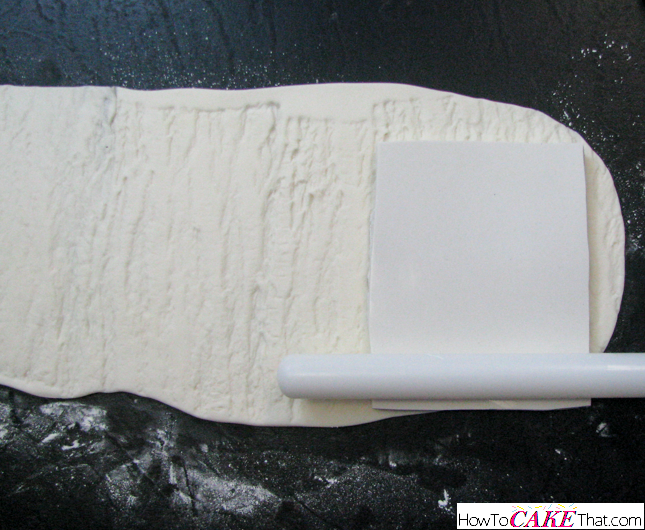 Also, this fondant strip is not wide enough to go all the way around the cake. Since the bark panel has so much heavy texture, it's very easy to add more strips on and hide the seams. I'll show you how later on. Now it's time to prepare the cake for the fondant bark wrap. I brushed around the sides of my cake with a little water. 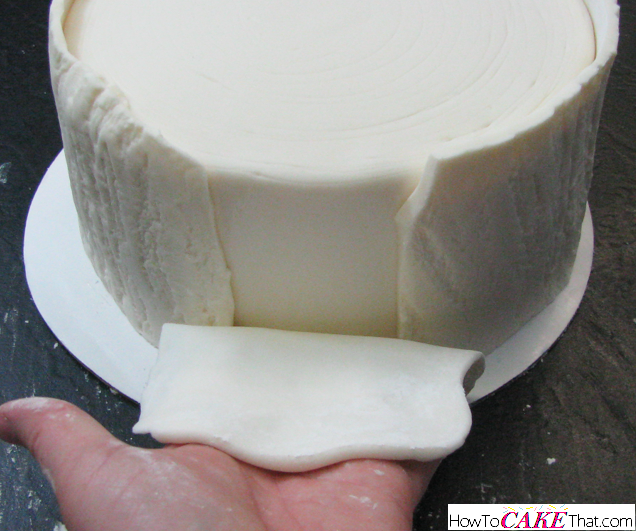 Be sure to cover every inch with a thin coating of water so the fondant wrap will stick well. 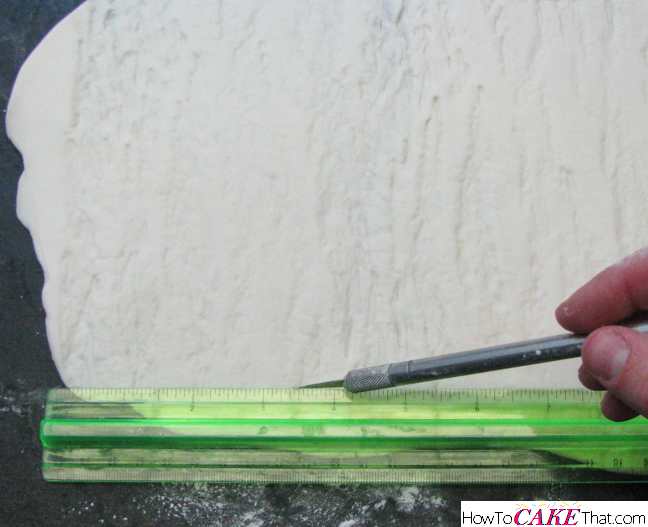 Lift and place the panel on the side of the cake. 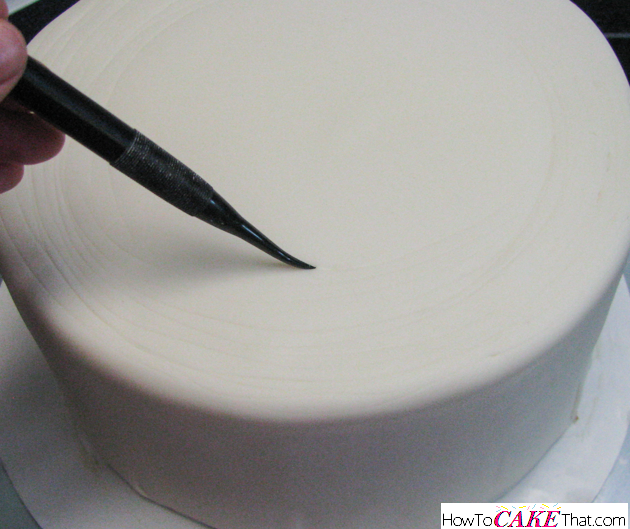 Be sure to press your hands all over the surface of the fondant panel to ensure there aren't any trapped air bubbles. But be careful to not press so hard that you rub out the nice bark texture. Since this first panel will be the widest piece on my cake, I want this to be the front of the cake. 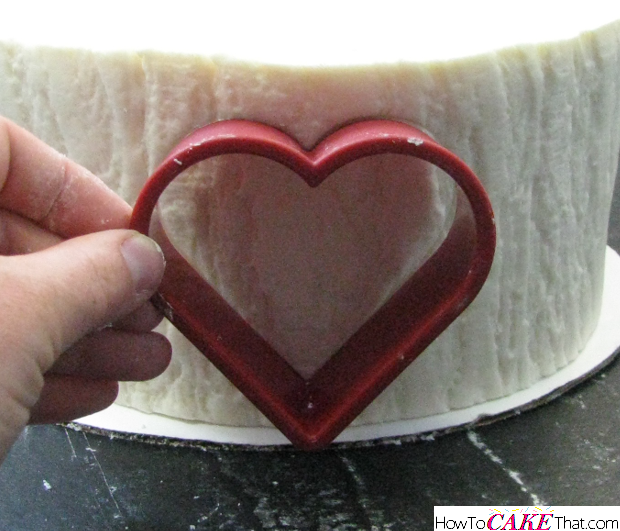 Working quickly - before the fondant panel has a chance to permanently adhere itself to the layer of fondant underneath - press a heart-shaped cookie cutter into the fondant to leave a nice indentation in the fondant to give a guide for cutting. Just right! I did not cut all the way through the fondant. This will just serve as a guide for trimming out the panel layer with an Xacto knife. Using an Xacto knife, I lightly traced around the heart a little at a time until the panel layer could be removed. 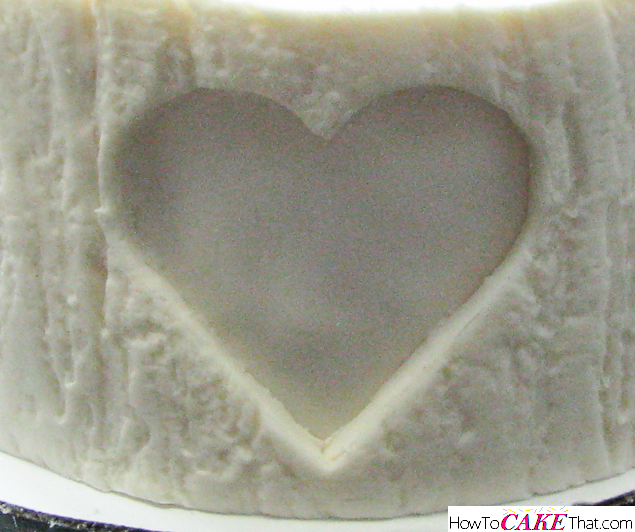 You can see in the upper right hand corner of the heart that I used a bamboo skewer to see if I was cutting deep enough. 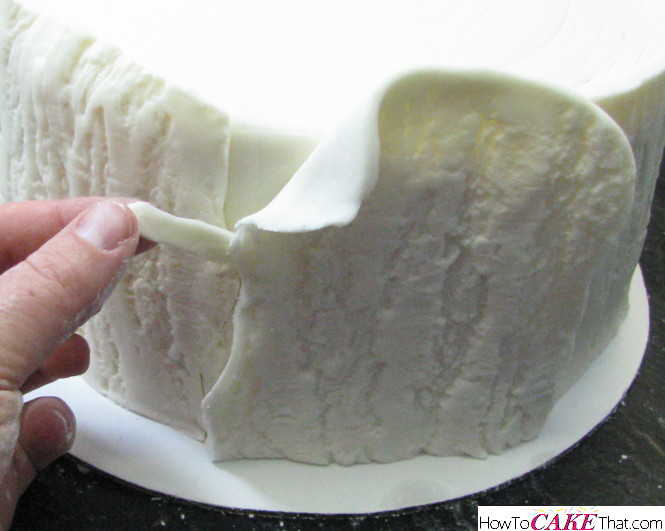 Be super careful to not cut the layer of fondant underneath that is stuck to the cake. While I was holding the peeling piece in one hand to support it and keep it from stretching the panel, I carefully used my Xacto knife to help trim and remove the rest of the heart piece. Now we will begin working on the rest of the panel while the water on the heart piece is drying. Since my panel wasn't wide enough to wrap around the entire cake, I needed to fill in this gap. 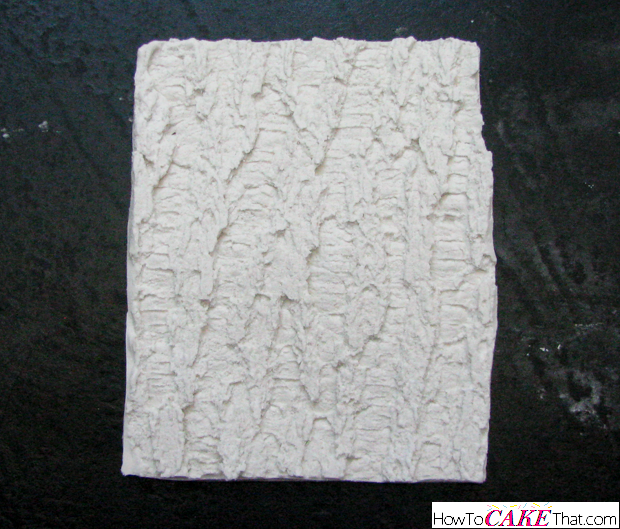 To do so, I rolled out another small panel of fondant, pressed the mat into it, and trimmed it just as before. 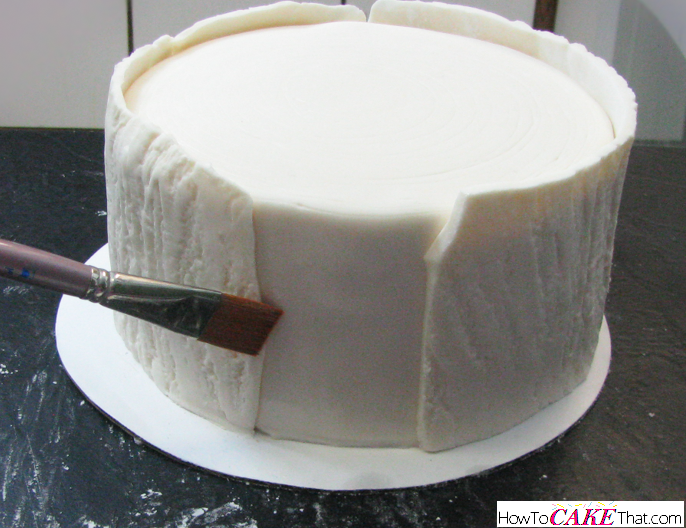 Next, I brushed the surface of the uncovered fondant with water, and also brushed the edges of the panels on the cake. Next, I pressed the panel piece onto the cake. To make this panel patch piece fit perfectly with the rest of the fondant bark, I overlapped the edges of the large panel and smaller patch panel piece and cut through both pieces with my Xacto knife. I cut a wavy line through both pieces to help the seam blend more naturally. I did my best to follow the bark pattern. 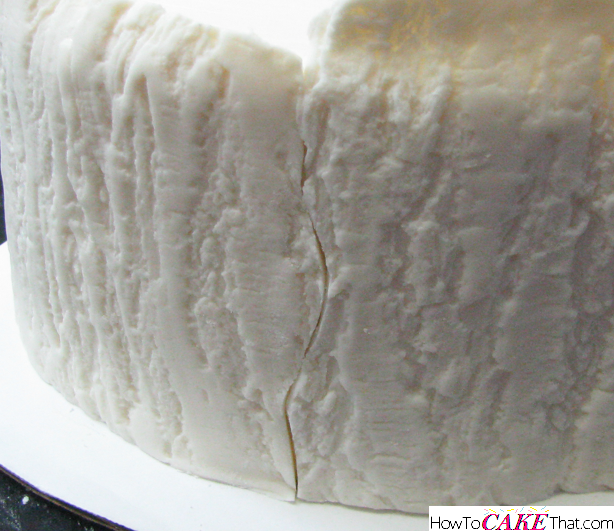 Next, I peeled away the two cut pieces of fondant - there will be a cut piece from the patch piece of fondant (the outer layer), and also a piece underneath the patch piece of fondant from the larger panel... be sure to remove both pieces, otherwise the bark will not fit together. Look how the seam runs together so nicely! This one will be easy to hide! Using my fingers, I just pressed the fondant seam pieces together and they magically disappeared! Since the bark is so heavily textured, it is so easy to hide seams! 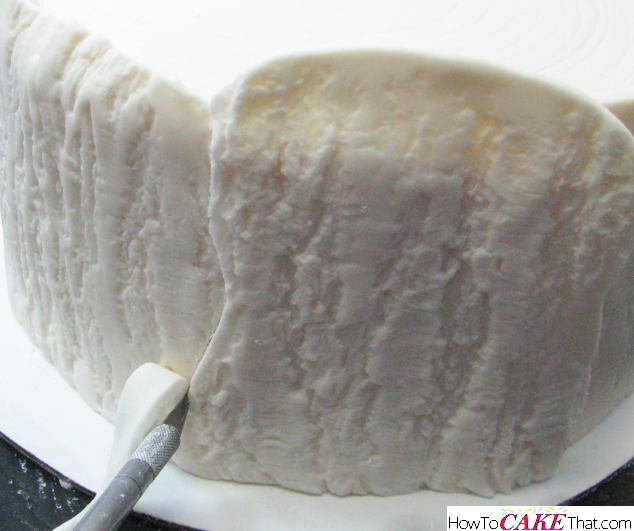 If for some reason your fondant seam is having trouble sticking together, it may be getting a little dry - just brush it with a little water and it should hold together. I also wanted to add another fun little detail to my tree stump... a little crack. 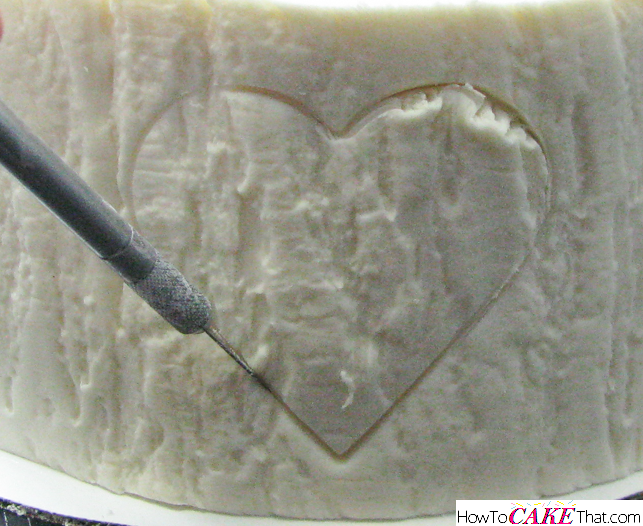 To do this, I used a veining tool and pressed into the top of the fondant to draw a line. It will look really cool once the cake is painted. 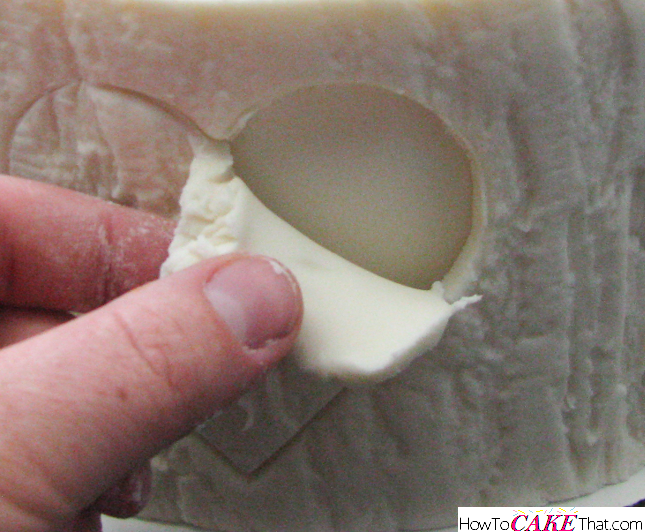 Be sure to not press so hard that you accidentally cut through your fondant and expose the frosting underneath! 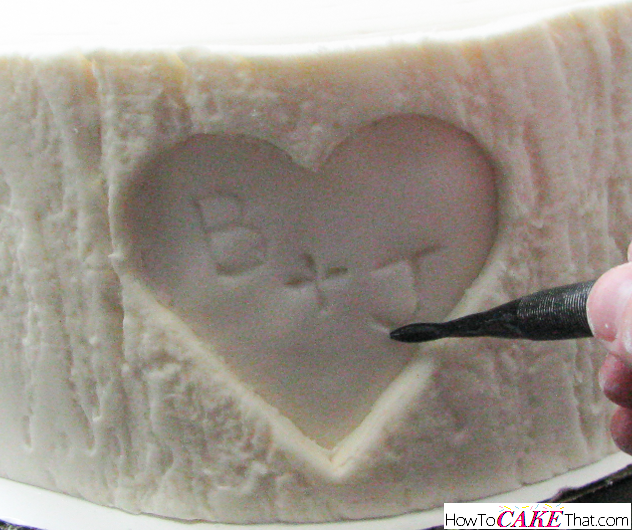 Now that the little heart piece is just about dry, I used a wide tip veining tool to press the initials of the bride and groom into the fondant. 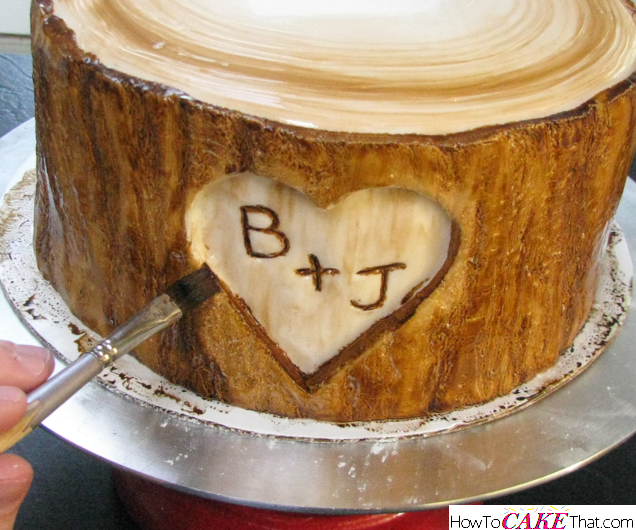 By pressing the letters into the fondant, it gives it the illusion that their initials are actually carved into the cake. 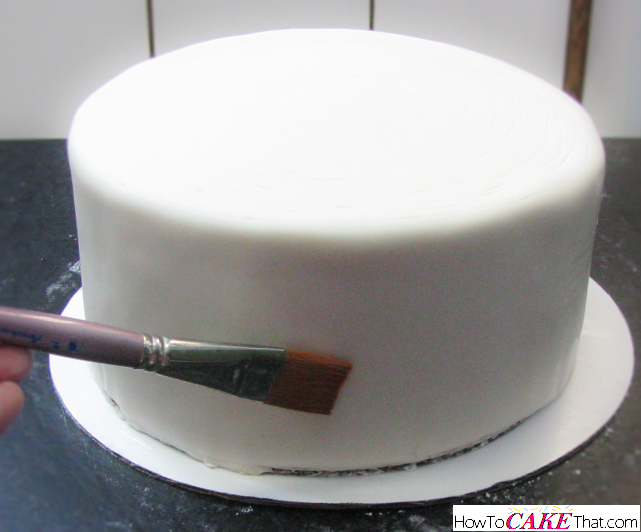 Time to paint the cake - whoo hoo! 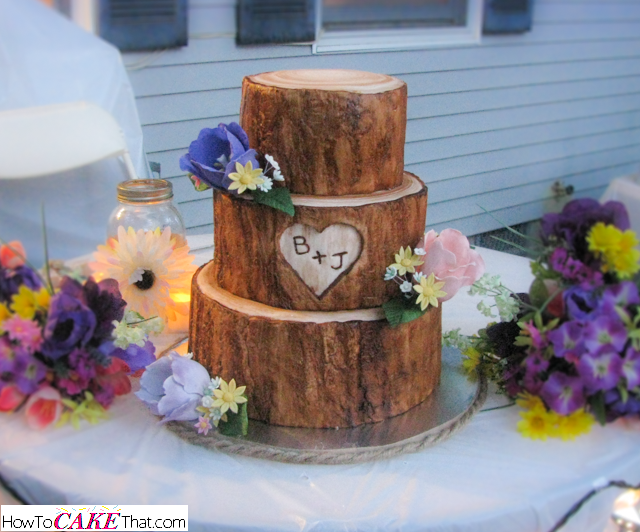 To paint the top of the tree stump, I placed the cake on my turntable. I then made a thin watercolor paint using a tiny bit of Wilton brown gel color and vodka. 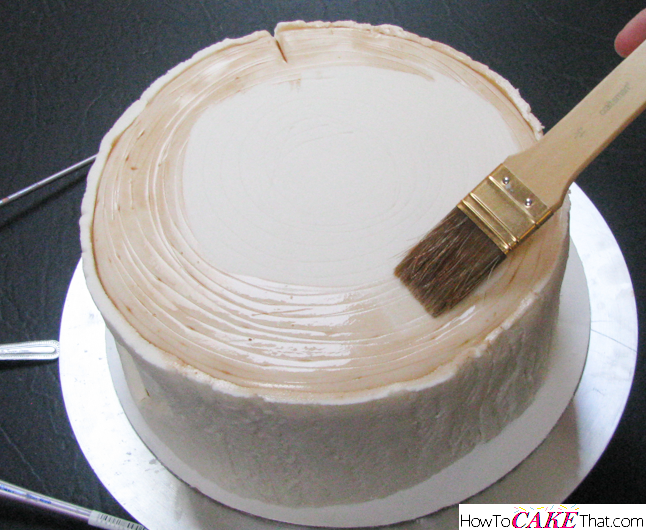 While slowly spinning the cake on the turntable, I used a large brush to paint the light brown color on the surface of the cake. Since my cake will be stacked and have a smaller cake sitting on top, I didn't bother painting the center of this cake. Now it's time to add the darker rings. Create a slightly darker brown watercolor paint with the Wilton brown gel color and vodka, and dip the thin edge of the large brush into the paint. 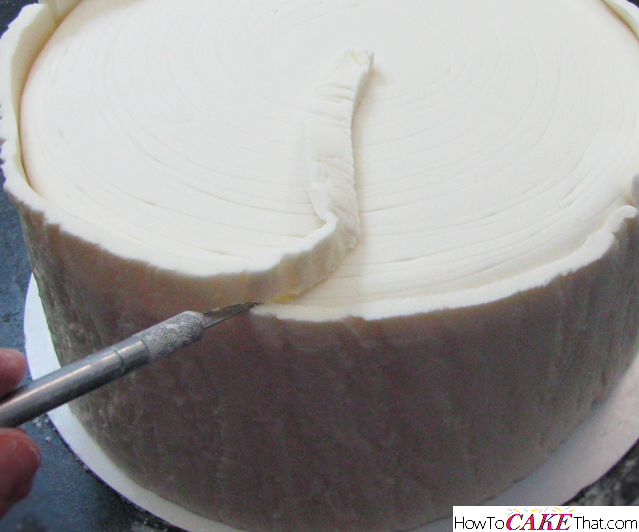 Spin the cake on the turntable a little faster this time and, while the cake is already spinning, very lightly begin pressing the edge of the brush onto the cake to create thin darker brown rings. Add more watercolor "paint" as needed. Using the lighter color watercolor, paint the inside of the heart. Use the slightly darker brown watercolor edible paint and a small detail brush to add little variations in color to make the carving look more natural. Yay! Now it's time to paint the bark! To do this, I created a medium brown watercolor paint using the Wilton brown gel color and vodka. 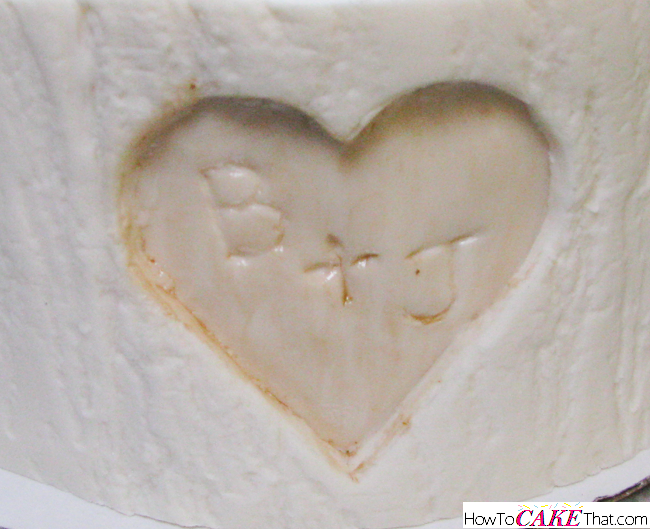 I used a medium sized brush to paint directly onto the fondant bark. Begin by adding a little paint onto the top of the bark panel, and then work your way down the side. Be sure to brush in all different directions to ensure you cover every nook and cranny. Be sure to paint the inside edge of the heart. 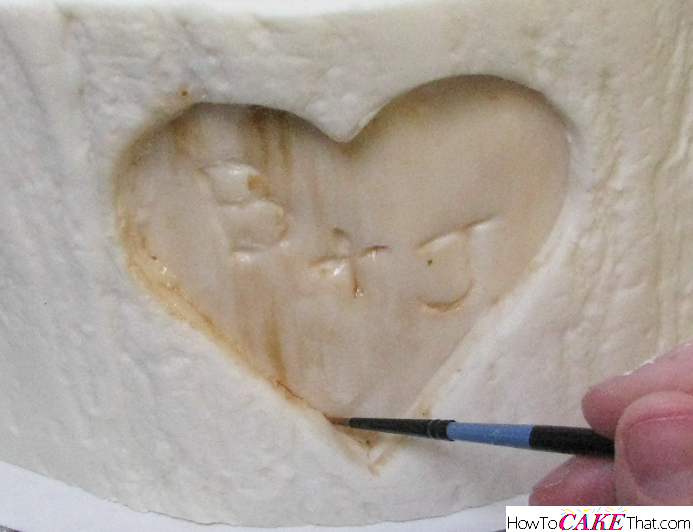 Using a tiny detail brush, be sure to fill in the initials with a dark brown paint. 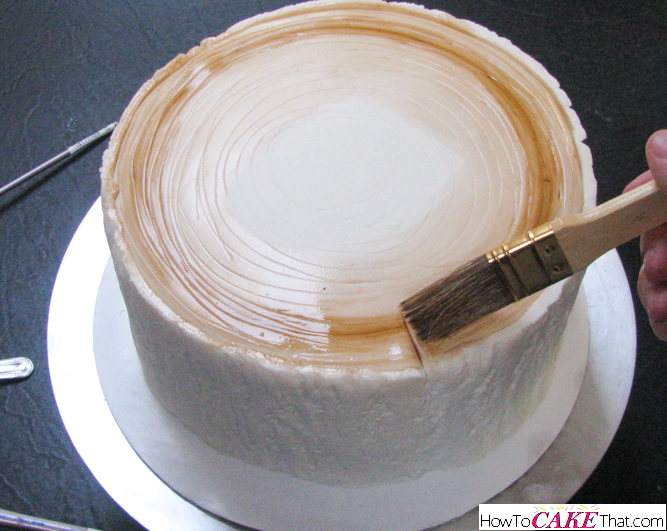 Also, with a small brush (like the one in the photo), be sure to darken any crevices with dark brown edible paint made with Wilton brown gel color and vodka... this will help the bark texture to really stand out! And if you have made a tiny little mistake like I did (look in the heart to the right of the "J") use a brush dipped in a little vodka to blend the dark color into the light color. It will magically disappear! 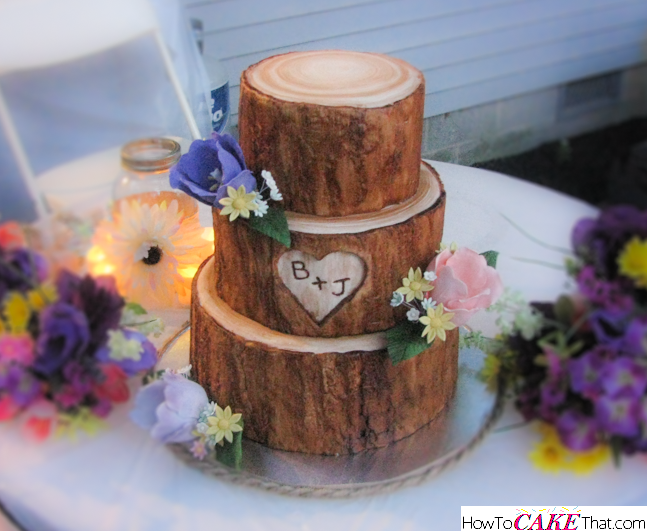 And that is how you make this realistic tree stump wedding cake! I hope you have enjoyed this tutorial! God bless! !